Luxury meets sustainability: the Deep Blue Hybrid is the first fully integrated system on the market that combines a hybrid drive system with the entire on-board energy management. Luxury meets sustainability: the Deep Blue Hybrid is the first fully integrated system on the market that combines a hybrid boat drive system with the entire on-board energy management system. 1 Powerful electric motor: delivers between 25 and 100 kW of continuous power at 360 V. Available as inboard, outboard or saildrive. 3 12 V batteries: system power supply for starting up the high-voltage battery system and the diesel generator. The Deep Blue system manages these batteries autonomously. 4 Efficient state-of-the-art diesel generator. Only runs when power requirements exceed the renewable sources and available battery capacity. Runs at optimum operating point feeding the 360 V system directly. 5 Onshore power chargers: for charging the system from the AC mains supply in port. 6 Drive connection box: the heart of the drive management system. This is where all the connections and system management functions for the drive train are concentrated. 7 Onshore power connection: The large battery bank can be recharged with sufficient energy for the voyage when in port. 8 System connection box: this is where the connections and system management functions are linked together to form a complete system and where other (convenience) functions for larger boats and yachts are integrated. 9 AC inverter: provides independence from power conditions on land. Voltage and frequency can be freely configured. 10 Isolated AC power system (120/240 V AC current, 50/60 Hz): equipment and power sockets are connected via an AC power distributor. 11 Bi-directional DC/DC converter: connects the 24 V DC power system with the battery system, allowing the free transfer of power. 12 24 V on-board batteries: act as a buffer and redundant power store for the entire on-board electrical system. 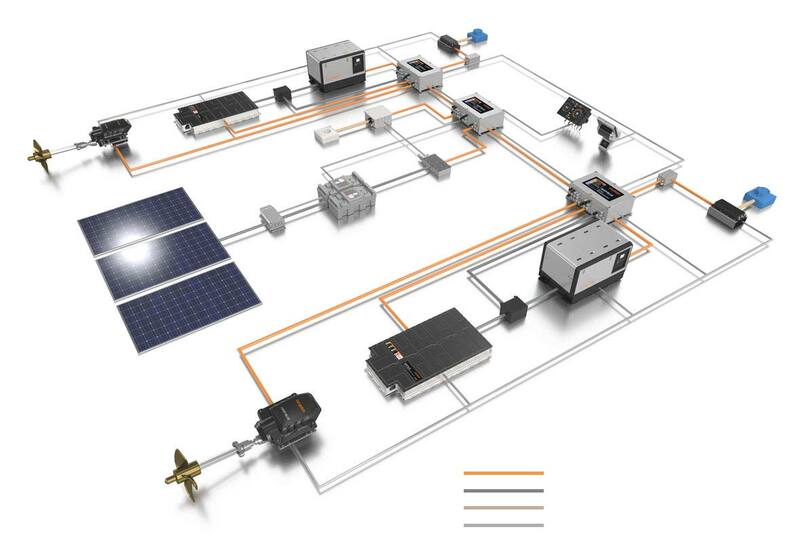 13 Solar charge controller: converts power generated by photovoltaic into the right voltage for the on-board power system. Highly efficient thanks to MMP tracking. 15 Electronic throttle: controls the performance of the electric motors. The twin remote throttle allows individual control of two drive trains. 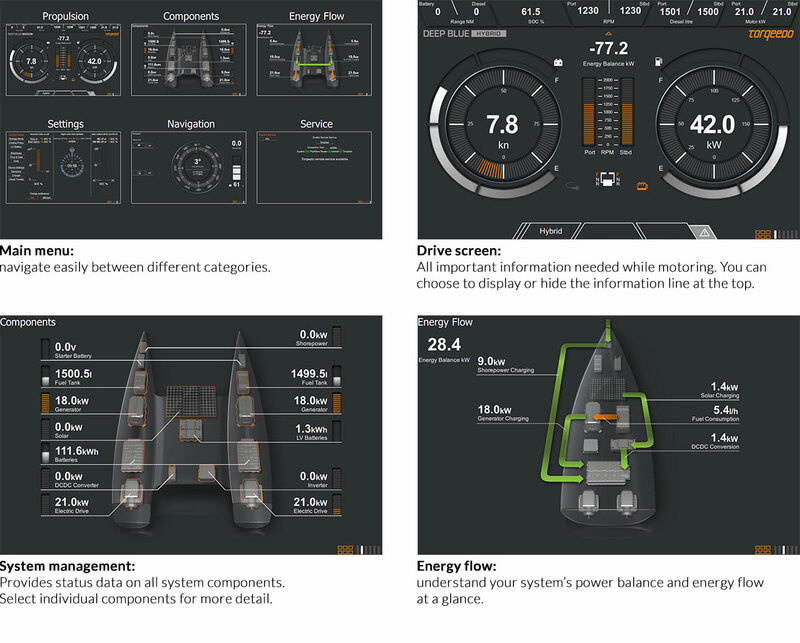 16 Display with onboard computer: allows the flexible management and modification of parameters controlling the usage patterns of the system. Cutting edge battery technology is the key to e-mobility solutions which are at the same time safe, reliable and performant. Cooperation between BMW i and Torqeedo has made the very latest in automotive battery engineering available for boats. The new battery technology introduced in the BMW i3 is available for all DEEP BLUE systems. Torqeedo’s HVDC converter generators supply DC power directly to the Deep Blue system without the inefficiencies that limit standard generators, providing long-range motoring and efficient backup power for serial hybrid systems. The converter generators eliminate the fixed ratio between rotational speed, power and voltage output. Integrated into the information, safety and energy management system of the Deep Blue Hybrid, the generators produce any combination of power and voltage as required, adopted to individual setttings. ELECTRIC Generator off; completely electrical operation. CHARGE The generator recharges the batteries. As soon as the desired level of charge has been reached, the HYBRID mode starts automatically. HYBRID The generator starts automatically if the battery charge falls below the previously defined level. FLOAT Motoring with the generator operating, generating exactly the amount of power the motor is using, and maintaining the battery’s state of charge. •	Low-voltage DC power for lighting, radio, navigation, winches, etc. Deep Blue Hybrid offers intuitive operation presented on the multifunctional display, providing a complete overview of the entire system and access to all control functions. The software keeps an eye on everything and prevents errors like deep-discharging batteries. 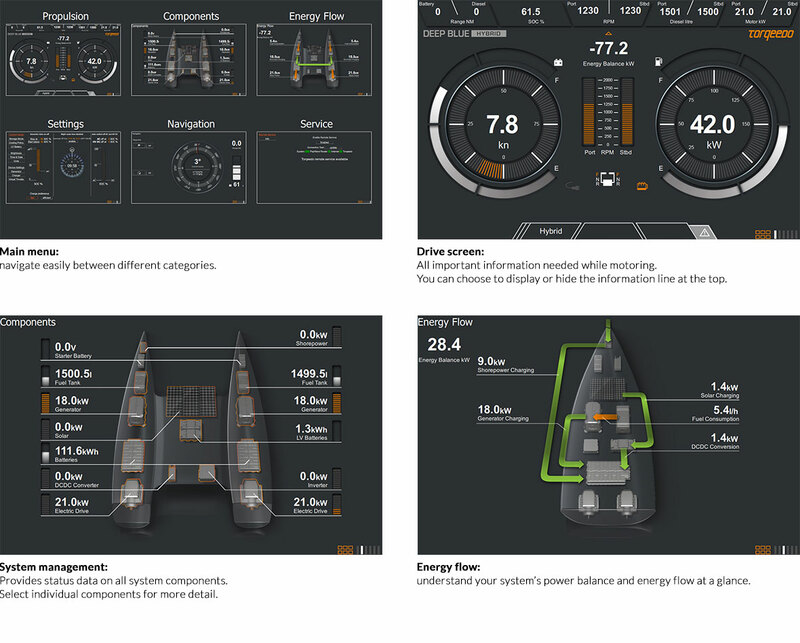 An easy-to-understand graphical user interface is available as either multihull or monohull and delivers complete, up-tothe- minute system visualisation. We’ve come to expect an intuitive way to operate our technical devices. We expect detailed information, nicely displayed and clearly arranged. We expect that the objects we use are both beautiful and functional. This is what spurred us to create the new Torqeedo throttle family and improved user interface for Deep Blue. Our premium throttles offer the right solution for every application, whether for sailboats or on motorboats – ergonomic, strong and functional. All premium throttles come with Bluetooth built in for simple integration of Torqeedo’s TorqTrac smartphone app. Powerful and silent electric drive systems allow manoeuvring and sailing at hull speed. High-performance batteries adapted from the automotive industry enable prolonged motor-cruising for up to 50+ nautical miles without use of a generator. Solar power generated on board and hydro-generated energy – the propeller rotates while boat is under sail – provide additional propulsion. Besides, the integrated generator provides sufficient energy to cover long distances, if required. The slowly rotating electric drives allow precise maneuvering and in combination with joystick docking makes putting out to sea and berthing as easy as pie. The integrated management system of Deep Blue Hybrid makes it possible to use available power in any way you wish – for the powerful high-voltage drive system, for the 24 V on-board power supply or to operate equipment with 230 V AC current. Deep Blue Hybrid is designed in such a way that energy is always available where it's needed. The combination of energy generated from renewable sources and by the generator means that there is always sufficient power available. However, the generator does not need to run for as long. Clean and safe electricity can be used for all equipment and so it is no longer necessary to have propane or petrol on board. 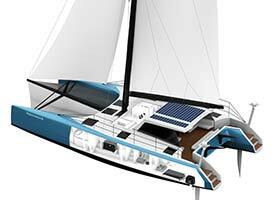 A tender can also be run electrically and can be charged from the Deep Blue Hybrid on-board power system. Particular attention should be paid to standards compliance and safety during the development of a hybrid drive system. During the years spent on developing the Deep Blue Hybrid system we followed safety concepts that, for example, are standard in the automotive industry – but which previously could not be found in powerful electric drive systems for boats. In addition, electrical drive systems for boats pose special challenges that are not relevant for other industries. In this respect, it is not enough to just follow the standard of other industries for high-voltage boat drives. As we are used to setting new standards, we have done so with regard to safety. Below you will find a number of examples of the Deep Blue Hybrid's unique safety concept. Isolation monitor: constantly monitors that the voltage from all 360 V components is completely isolated from the boat – not just for individual system components but for all of them. If damage is detected, e.g. to the cable insulation, the system will issue an alert. In the event of dangerous insulation failure, the system will be shut down. All components are waterproof: Components that were not specifically developed for boats are not always waterproof. All the components of a high-power system on a boat must be waterproof to guarantee safe operation. That is why all of our components are waterproofed and, in some cases, are further protected with water sensors. Automotive industry-level battery safety: The first lithium batteries for the marine industry with the advanced quality standards of the automotive sector are the result of Torqeedo's collaboration with established battery manufacturers. Integrating a battery into a drive system and the associated safety concept alone requires considerable effort that can only be achieved by working together with the battery manufacturer. Battery venting: In the unlikely event that the redundant safety mechanisms of the battery fail, the battery cells can reduce their temperature and pressure via a pressure valve. While batteries are installed in electric cars in such a way that they can discharge battery gases directly onto the road, on electric boats the gases must be channelled safely off the vessel. We developed the first safe venting system for boats for the Deep Blue System. Battery damping: All components on fast and seagoing boats are subject to constant high levels of shock that exceed shock levels on the road – in some cases over 12 g of acceleration force. The same holds true when trailering the boat. Since batteries and battery electronics are not designed for these constant impacts, they need their own damping system on boats (in addition to the damping mechanisms within the battery). Torqeedo is the only company in the world that provides this for maritime use. Customers are increasingly expecting environmentally friendly solutions for their drive system and power supply. This is coupled with the demand for quiet and reliable solutions. In the past there were no industrially produced systems available to meet these requirements. 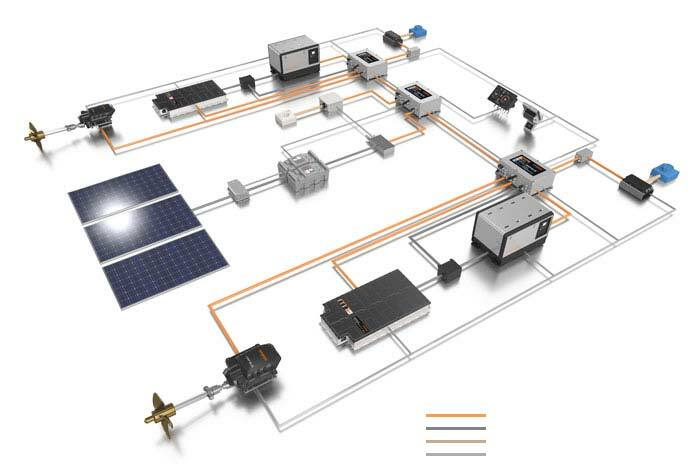 Customers are increasingly expecting environmentally friendly solutions for the drive system and power supply. This is coupled with the demand for quiet and reliable solutions. In the past there were no industrially produced systems available to meet these requirements. High-end components do not exist for the custom project. High-tech safe lithium batteries, for example, require an intensive design-in process in close cooperation with the battery manufacturer's research and development department. However, reputable high-voltage battery manufacturers do not supply their batteries for custom solutions that they are not familiar with and that have not been coordinated with them in detail. Creating an integrated hybrid system requires a comprehensive research and development project accompanied by many person-years in the field of development running to the tune of several million euros. These efforts are not undertaken for custom projects, leading to lower reliability and a lack of complex but important safety features (such as pilot lines). The system integrator has the statutory duty to ensure that the hybrid system complies with all the relevant and mandatory standards such as the Machinery Directive and the EMC Directive. Custom hybrid systems do not generally meet these standards. Since a boatbuilder is responsible for ensuring that the entire boat complies with standards, the installation of custom-built hybrid systems constitutes a serious risk for boatbuilders. Unlike custom-built hybrid systems, DEEP BLUE HYBRID addresses the requirements of environmentally aware customers, offering a turnkey solution that guarantees compliance with the relevant norms and standards. DEEP BLUE HYBRID was created in an extensive research and development project involving a large number of mechanical and electrical engineers over several years. The components were carefully selected and coordinated with an overall system. Essential inspections and certifications were performed at system level. High-end components such as hybrid batteries from the automotive industry were integrated into the system. Torqeedo assumes responsibility for the functionality and compliance with relevant standards for the whole system. DEEP BLUE HYBRID was developed on the basis of modular components. It allows flexibility and scalability without affecting system integration and reliability. You desire contact with no obligation about the Deep Blue Hybrid drive system?